Carving has been a part of life in the Marianas ever since the first Chamorros settled here thousands of years ago. It was a skill they used to take the resources of the natural world and transform it for different uses, which would sustain their daily lives. Chamorros carved bones in order to make spears and hooks. They also famously carved stones, such as the towering latte stones to hold up their houses. In addition, the carving of wood was something essential to Chamorro life. Over the millennia, Chamorros learned the various properties of the trees in the Marianas and used them for specific tasks. Softer woods for example could be used for carving canoes or spear tips. Stronger, heavier woods would be used for the beams for buildings. Chamorros also had beliefs about the ideal time to cut wood. For example, wood cut during the full moon will rot faster than normal. During the Spanish period of Guam’s history, Chamorros first began to carve wooden furniture, such as tables and chairs made from the island’s hardest wood, ifit. Some families still have in their collections ifit coffee tables or dressers that were made during the 19th century. In time, the practice of Chamorro carving has shifted and moved from being a primarily utilitarian activity, to something meant to express more about cultural identity or creativity. This shift began in part because of Guam’s location in the Western Pacific, on the edge of Asia. For centuries as explorers, soldiers, priests and whalers moved across the Pacific, Guam was a stopping point for taking on supplies or relaxing. Chamorros began to create small tokens or souvenirs to sell to these visitors in order to make some extra money. These items varied depending on the carver, but included lamp stands, cups, utensils, crosses and statuettes. In 1937, two Chamorros travelled to Washington D.C. to lobby the US Congress for increased political rights for their people. Francisco Baza Leon Guerrero and BJ Bordallo were the first Chamorros to ever meet with a President of the United States, when they met with Franklin Delano Roosevelt. As a gift they offered him a number of items carved from Guam woods, most importantly an ifit coffee table. 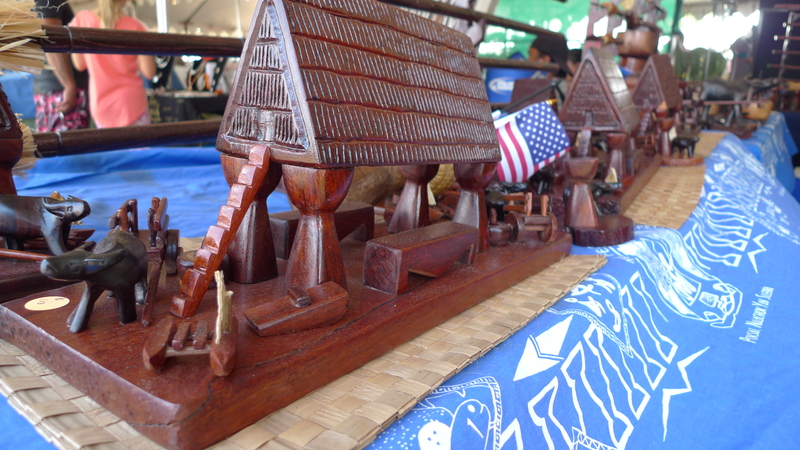 Up until today, Chamorros have continued this practice of providing carved works as a means of representing Chamorro culture and gineftao or generosity. When US President Bill Clinton visited Guam in 1998, Master Carver Robert Taitano prepared carved chairs for him and other VIPs. President Clinton also received another iconic carving, that of the Guam seal. This seal features various aspects of Guam’s cultural (the sakman or canoe on the sea) and natural history (the centrality of the coconut tree), and can be found used in all types of media, most notably the flag of Guam. Master Chamorro carvers such as Robert Taitano and also the late Segundo Blas, began to use that seal as the basis for gifts for VIPs. In time, the visual repertoire has been expanded to include other common local symbols such as karabao, canoes, ancient warriors and clocks carved into the shape of Guam. Segundo Blas also adopted the practice of storyboard making from other Micronesian islanders and used carved wooden boards in order to illustrate famous Chamorro legends. What began as something Chamorros did to represent their island to outsiders, has now shifted to being a point of pride for themselves. Families turn to carvers to create wooden plaques that carry favorite family prayers or scriptures or to celebrate their extended family by displaying wooden engravings of their clan nicknames for people to see in their homes. 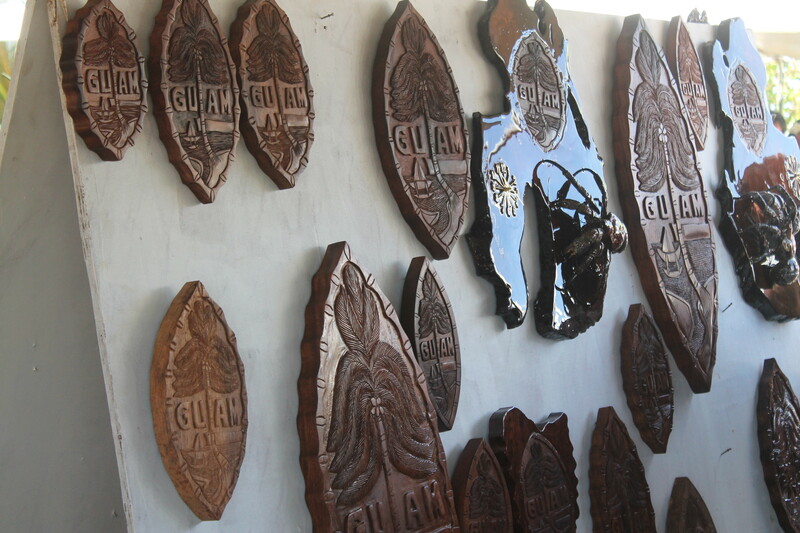 The use of local carving in order to express identity even extends to Guam’s political leaders. If you take a visit to the Guam Legislature in the island’s capital of Hagåtña, you will find that each Senator has their own locally carved signs with their name on it when they sit in committee or session. In May 2016, Guam will be the host for the 12th Festival of Pacific Arts (FESTPAC) where representatives from close to 30 island nations will gather to celebrate cultural arts in the Pacific. Dancers, filmmakers, scholars, weavers, navigators from around Oceania will come to perform, display or demonstrate their arts. The FestPac village will be located in the Pasea de Susanna in Hagåtña and comprise 35 huts where people can tour from one island culture to the next. 8 of those huts will be used for the showcasing of Chamorro traditional arts, including wooden carving. According to George Francisco, owner of Chamorro Heritage Carving and chairperson of the carving subcommittee for the Guam delegation to FestPac, the carvers of Guam will be providing daily demonstrations of shell, wood and bone carving and also exhibits of historical and contemporary examples of Chamorro carving. Greg Pangelinan, who was named a Master Carver in 2013, is planning a large surprise for the event, which he refers to as a “Unity Project.” The Master Carver promises to make a 7-foot tall wooden replica of a latte stone, with special carvings meant to indicate each of the islands participating in this year’s festival. Visit Guam this summer for 12th Festival of the Pacific Arts, which will be held on Guam from May 22 to June 4, 2016. FestPac 2016 is an opportunity to experience a rare close-up look at 27 remote island communities that will come together to celebrate some of the most intriguing and fascinating cultures of the world. For more information about FestPac 2016, visit www.guamfestpac2016.com.